The holiday season is here and because I’m always getting questions about my favorite brands and products, I had to put together another gift list. This time, I’m focusing on the perfect eco-friendly stocking stuffers. These smaller gifts are also perfect as hosts/hostess gift or as a treat for yourself! Enjoy! 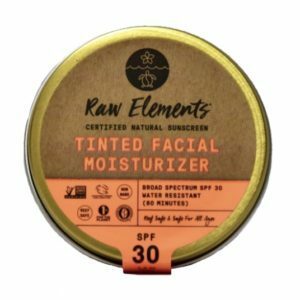 Raw Elements makes amazing zero waste products, my favorite being the tinted moisturizer. Their certified all natural and organic ingredients actually perform. I throw on the tinted moisturizer without any other makeup and feel confident. With the SPF, I don’t have to worry about sun damage (which we need to protect against in the summer and winter). And, it comes in a tin (not plastic!). Enjoy! Use code ABBYSFOODCOURT10 for 10% off your purchase. 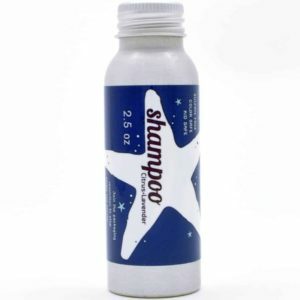 Plaine Products makes my favorite eco-friendly personal care products. I’ve been using their shampoo and conditioner for a year and am in love. Not only do they work well, but Plaine Products is on a mission to rid the world of single use plastics for personal products! All the products come in stainless steel bottles that you can conveniently send back to them when you finish! The travel sizes are super cute and are the perfect small gift. Use code abbysfoodcourt10 for 10% off your purchase! 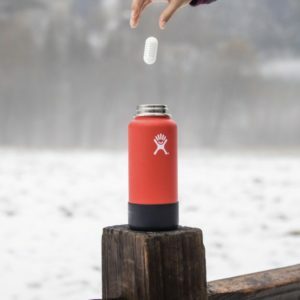 In a recent newsletters, I discussed the importance of hydration for your health and the importance of carrying a reusable, non plastic water bottle with you wherever you go. In order to have confidence in your water quality, no matter the source, I recommend using a GoPure Pod water filter. It’s time to help your loved ones reduce their reliance on single use plastic and have the highest quality water! Use code ABBYSFOODCOURT25 for 25% off your purchase. I’m not shy about my love for teapigs tea (check out my blog post There’s WHAT in my tea?). They make the most delicious and fun tea flavors from full tea leaves. The packaging is biodegradable and there isn’t any plastic in the packaging or the tea bags themselves. The pic ‘n mix product is perfect- you choose 12 tea flavors and receive 2 tea temples in each flavor. I highly recommend the peppermint liquorice, apple and cinnamon, snooze, and organic cleanse. Enjoy your cuppa! Use code abbysfoodcourt20 for 20% off your purchase (code active until January 31, 2019). Toothbrushes? YES! In honor of my mother-in-law, who is a dentist, I had to include toothbrushes on this list! 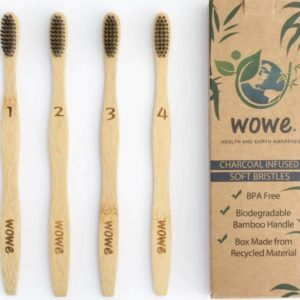 One four pack of WowE bamboo toothbrushes with last you (or the recipient) a whole year! Almost 50 million pounds of plastic toothbrushes end up in landfills every year. That plastic takes up to 1,000 years to decompose and can leak pollutants into the soil and water. Switching to a bamboo toothbrush might just be the easiest swap to reduce your plastic use! The bamboo handles are biodegradable and WowE gives instructions to properly dispose of their products! I love the charcoal infused toothbrushes because charcoal has antibacterial, antifungal and antiviral properties. It also helps fight cavities, plaque buildup, and bad breath and has whitening properties! Save the planet and your teeth from coffee stains just by switching your toothbrush! Use code ABBYSFOODCOURT5 to get 5% off your purchase!